What's a ceili, sean nos and set dancing ? Irish Dancing & Music that's great ! we hope these tips will help encourage you to give it a try. Ceili Dance: a ceili (kay-lee) is a traditional Irish gathering for fun, fellowship, and laughs (or craic as the Irish might say). 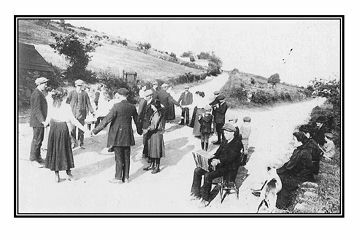 Traditional ceili dances were enjoyed at house parties and corner road gatherings in the rural countrysides. Decades later, they are still danced in Ireland. The bonfire, haymakers jig, siege of ennis, fairy reel, etc are very easy to learn. These traditional country folk dances have a follow the leader pattern that new dancers can pickup on their 1st attempt. Our dance caller will teach the basic 3's, 7's, jig step, and ceili swing at the start of the event. (easy stuff !) From thereon, we walk thru every dance pattern slowly at first. We won't repeat a pattern all night so jump in and join the fun as you won't learn how from the sidelines. We'll dance jigs, reels , hornpipes and a waltz . Its suitable to all ages, so bring the entire family along. Wear cool lightweight clothing - or layers so you can peel when things warm up. Leather soled shoes that glide are preferable (sneakers tend to stick ). If your hip creaks and you'd just like to watch from the sidelines, that's ok too. There are numerous photos on this website from the Vashon ceili's and Des Moines Irish Hooley's where you can sample these fun filled events. Below are two older ceili video links from Ireland, along with 2 recent sample of ceili's in the Pacific Northwest. Sean Nos Dance: this is an old style traditional form of dancing that originated in the Connemara region (west coast of Ireland). The low to ground stepping out to the music, isvery relaxed and similar to tap dance. This is not a stage show event like the Step Dancing you see in productions of Riverdance. Sean Nos dancing is a very impromptu, rhythmic, and low key accompaniment to a lively traditional Irish band. The footwork "battering" is great fun to watch and listen to. These are typically done as a solo performer or in very small groups and are well suited to all ages. Brush/Broom dance: is another traditional Irish dance form. There are many tales on how this dance form originated. One version is that men outnumbered women so the gents polished up their skills at home with a broom as a partner. Once mastered, they'd go to their local dance gatherings to display their skills in hopes of garnering the ladies attention. Another version is that the Irish Tinkers/Pavees/Travelers would perform this "showy" dance to attract attention and make it easier to sale their wares, like brooms, tools and pots. This dance tradition has been handed down for more than a century & is very entertaining. Riverdance is a prime example of Irish Step Dancing. 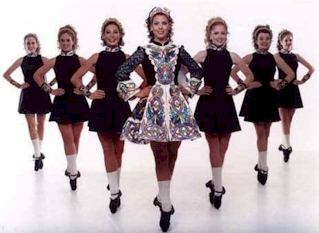 This is what most people think of when they hear "Irish dancing". But in fact, its only one portion of their dance repertoire. There are 2 primary styles of step dancing: soft shoe and hard shoe (examples above). Soft shoe and hard shoe dances are both extremely energetic and high spirited. These are very fun to watch & harder to do so that might explain why its mostly performed by youth. Their costumes are often very intricate & expensive so please keep your food at a safe distance from these performers and resist the temptation to touch their wigs. Their mom's will love you for it ! Ceili dances are much simpler than these Irish Step dances. Checkout the softshoe and hardshoe video samples below to "hear" the difference in styles. Irish Set Dances: This is perhaps where American square dancing evolved from - but we took much of the high spirited energy and footwork out of it. Irish Set Dances are danced with 4 couples in a square. A "set" includes as many as 7 different figures (each figure is a dance all to their own ). Thus the name SET dance - its a set of dances! When you step out on the set dance floor be prepared to dance ALL the figures in a given set. Dancers weave thru intricate patterns with maneuvers like: lead around, house, body, little Christmas, dance at home, swing, & chain. The names of the set dances will typically hint at what region of Ireland they originated from, like the West Kerry Set or Aran Set. Set dances are faster paced than ceili's, highly energetic, and fun. Set Dancing is VERY popular thruout Ireland today. Hundreds of couples will grace the dance floor in most every Irish community on a weekly basis for fast paced action ! They are not couch potatoes and its shows in their wonderful clattery footwork called "battering". When in Ireland - be sure to go to a set dance event. If you'd like to study up on a set dance, here's a useful web site www.setdanceteacher.co.uk Leather soled shoes that glide are recommended. Wooden heels help to accent your footwork, and dress in layers so you can peel down when you warm up. Bill Lynch publishes a Set Dancing magazine and hosts a website with great info & photos - it also includes links to many short set dancing video samples ! so go check out that good stuff. I'll put 4 samples below to give you a taste. .Set dance lessons are held ever Sunday at Mick Kelly's near Seatac airport and will also try to squeeze a set or 2 in during the Irish Hooley's in Des Moines. Lilting: is a traditional form of music in Ireland. They don't need instruments, they take their music w/them whereever they go. Here's a video sample of Seamus Brogan lilting the Mason's Apron, plus Seamus Fay from Co Cavan w/Fraher's Jig . We hope to see you at an Irish dance or session soon !